The annual Nordstrom Anniversary Sale launches this Thursday (for Rewards Members only), so I thought I’d share some of my favorite new fall arrivals on the site right now! Don’t forget – Nordstrom Cardholders will enjoy double points from July 9-16th! Sale will open to the public on July 17th. – This tweed coat from MSGM is numero uno on my list for fall. So chic and fun! Would look awesome with these inexpensive faux leather pants and my favorite black pumps! – Looking for a cute and comfortable pair of ankle boots for fall? This flat pair by Balenciaga is a winner. Love the subtle studded heel! – This adorable lace A-line skirt will be a fab transitional piece from summer to fall! Pair it with a sweater and pumps for a sophisticated and feminine office outfit. – My current go-to travel flats are now available in black! Score. – Since I’m still on a blush kick, this Carven cocoon coat has me starry-eyed. – On the hunt for a new bag for fall, but don’t want to spend over $1,000? This python-embossed crossbody by Rag & Bone is sleek and modern with just the right amount of edge. It’s just under $600, and will look great with all your fall/winter neutrals. 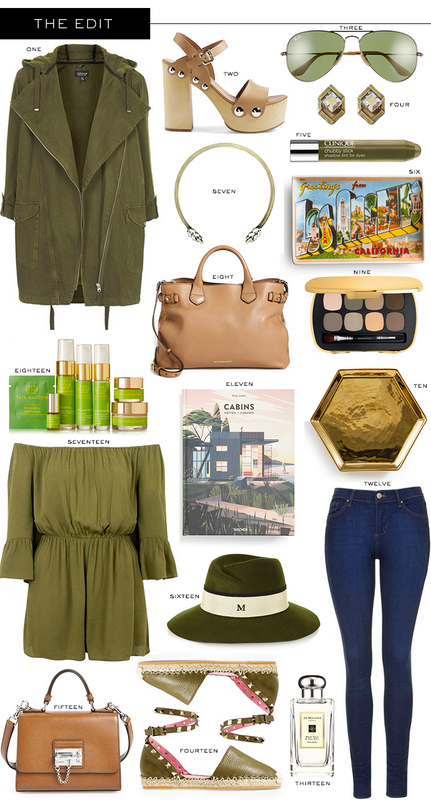 Loving all the olive green you’ve showcased here – I’m really digging that hue lately! Those Valentino shoes are to die for, can’t wait for the sale! That army green topshop jacket is fabulous, would be so great for this Fall! Tata Harper is one of my favorite skincare lines, their travel sizes are lifesavers. Gorgeous picks, loving the espadrilles! I’ve been obsessed with army green lately! Love that romper!